There has to be something therapeutic in getting inked. Because I can assure you that the pain is, at some point, pleasurable (and no, I double checked and I’M NOT a masochist :P). To me it’s like a ritual, an event I look forward to time and time again. Getting nervous one or two days before, sweating a little bit right when the artist is getting the materials ready, and then sighing on relief when the first prickle happens (that is when you have that moment of realization and you think “yasss! I can do this!!!”). Getting tattooed is different for everyone. 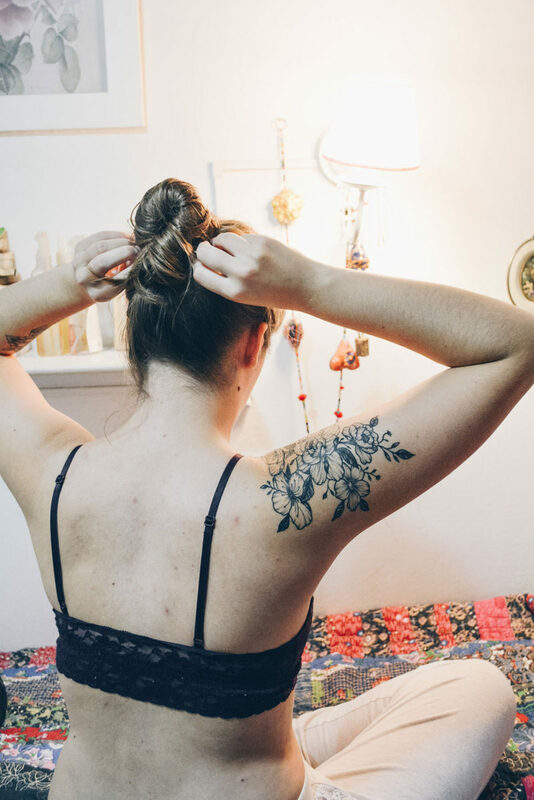 Some people like to give their tattoos a meaning, and some others don’t. I already covered this when I made the post of my first tattoo. When I decided to get my first tattoo, I thought that it’d be sacrilegious to have a tat on my body that had no deep meaning behind it, so naturally I gave my first babe lots of meaning, and part of it was that I had finally dared to be stabbed with needles for the mere aesthetic pleasure of the final result XD. But then… then this tattoo happened. Why did I get flowers on my shoulder you might ask? Because I felt like it. There. I said it. Simple as that. After the hype of getting my first tattoo, I must confess I started being slightly critical of it. Even though I love it to heart and it means A LOT to me, I still see things I wish were different: the lines could have been thinner, there are way too many parts were the artist’s steady hand failed… I realized I should have chosen my tattoo artist more carefully. Don’t get me wrong. I don’t regret my artist nor place decision. Back then, it was the conscious, right choice for me. But I was also very inexperienced and didn’t even know what to ask for or what kind of details I really did like. Now I know I like really thin lines, and I like them steady and clean. I like dot work, and shadows made by dots. 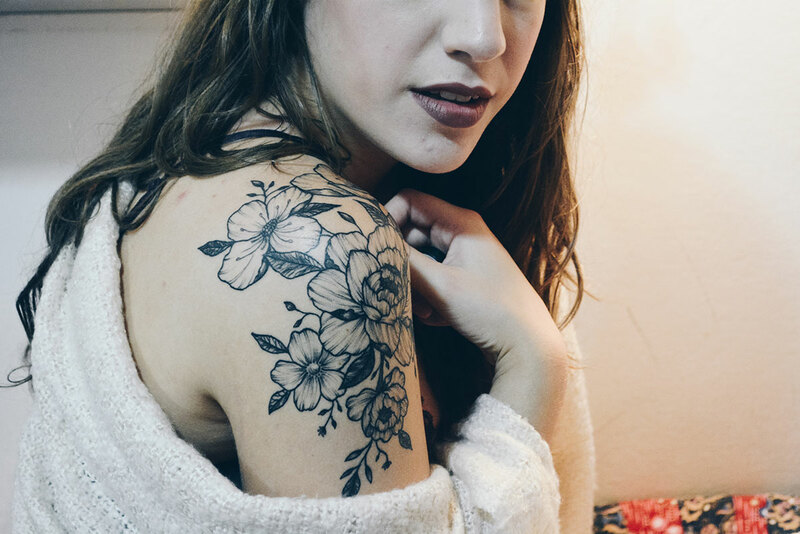 I even dare say I probably wouldn’t have gone to a house apartment to get tattooed if it wasn’t that I realized, from my first experience, that having it done at a studio where many artists work together doesn’t matter as long as the artist is the one (yes, to me it’s almost romantical LOL). 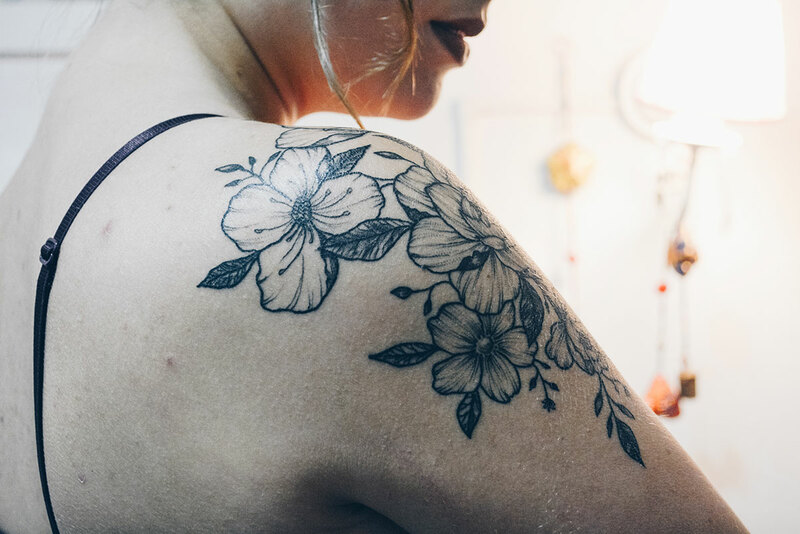 At the beginning of April, I started toying with the idea of getting new ink on my body. I knew I wanted flowers on my shoulder, just the way I have them now. I had already gathered lots of references, so it was just a matter of getting an appointment with a tattoo artist. Enter Maria Kekena, the goddess behind the floral art ♥. I first heard of her artwork when one of my coworkers, Steph*, got a tattoo to cover up a scar she has in the middle of her lower back. She had been recommended by friends and her opinion after getting tattooed was really positive. She told me that she felt reassured by Maria because she was really into doing her cover-up. And I don’t know about you guys, but when an artist has passion for their work, it shows. I have been to places where it seems like it’s more of a chore or “lets get this over with” and daaamn, I’m not that kind of girl at all! Anyway, after e-mailing each other back and forth, we scheduled an appointment for the 7th of April and so the tattoo began. It took Maria 3 hours to finish the tattoo, from the time I arrived, to the time she covered it up. From 1 to 10, I’d say the pain was about a 4. Originally 3, but I added an extra point for the time of the details came (the skin is always super sensitive by this time). The only painful parts were the leave closer to my neck, and then the one closer to the inside of my arm/armpit. Other than that, I am surprised that it was quite painless. People often say that the shoulder hurts quite a bit considering there’s less flesh on top and more bone, but it felt no different than my arm *shrugs*. How’s your experience with pain you guys? Do you like my new tattoo? 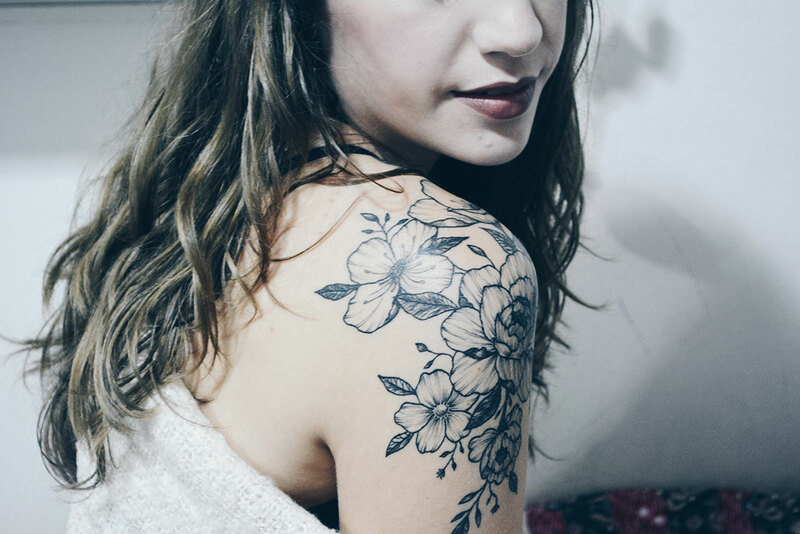 Maria Kekena is a tattoo artist based in Buenos Aires, Argentina. 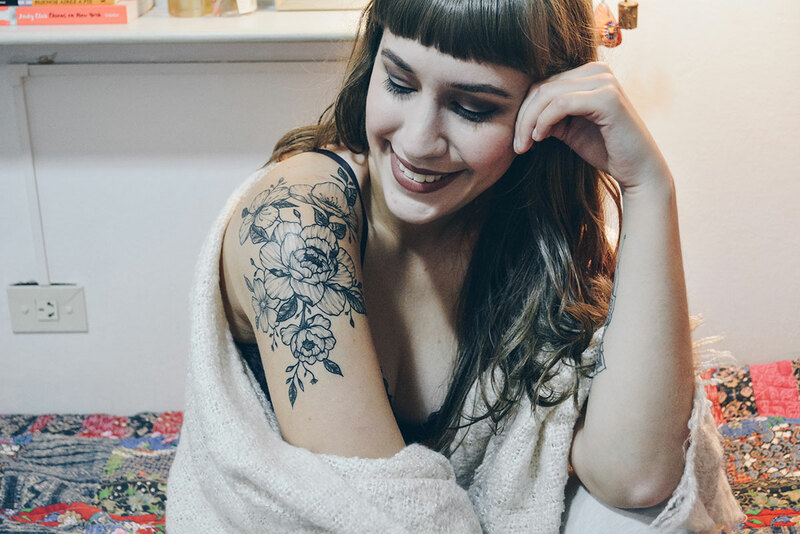 She makes black tattoos, and is specially amazing at thin lines and dot works. 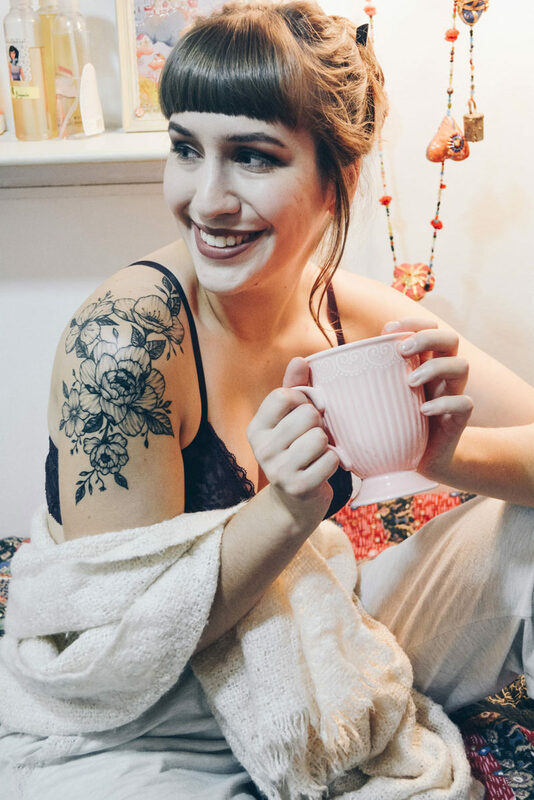 Most of what you’re going to see on her Instagram are flowers, mandalas and good-vibes tattoos. This is absolutely gorgeous, the intricacy of it is incredible. I’m completely here for the ‘because I felt like it’ tattoo mentality! If your tattoo has a meaning, that’s great, and if you just like what it looks like, that’s cool too! It shouldn’t matter either way. So glad I’ve stumbled across your blog too! Hi Ellie! c: Thank you so much for your words and for stopping by! Me encaaanta como se te ve, es precioso el diseño. Que bella!